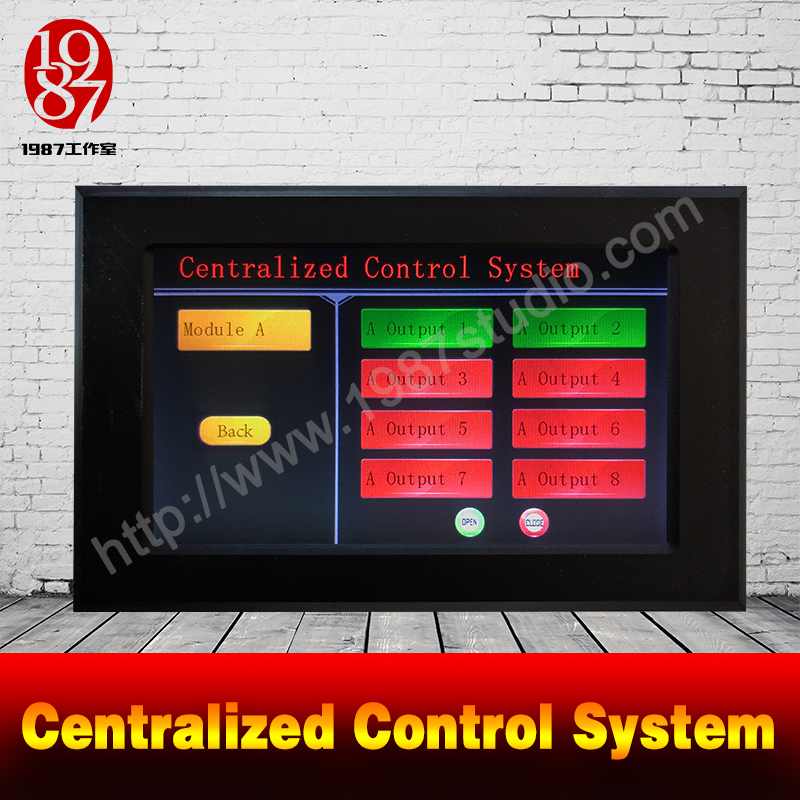 The Centralized Control System is designed for escape room owners to play the scenario's introduction audios, to release and lock all the locks, to light up and light off all the lamps and belts, to manipulate centrally all the electronic props. 1. 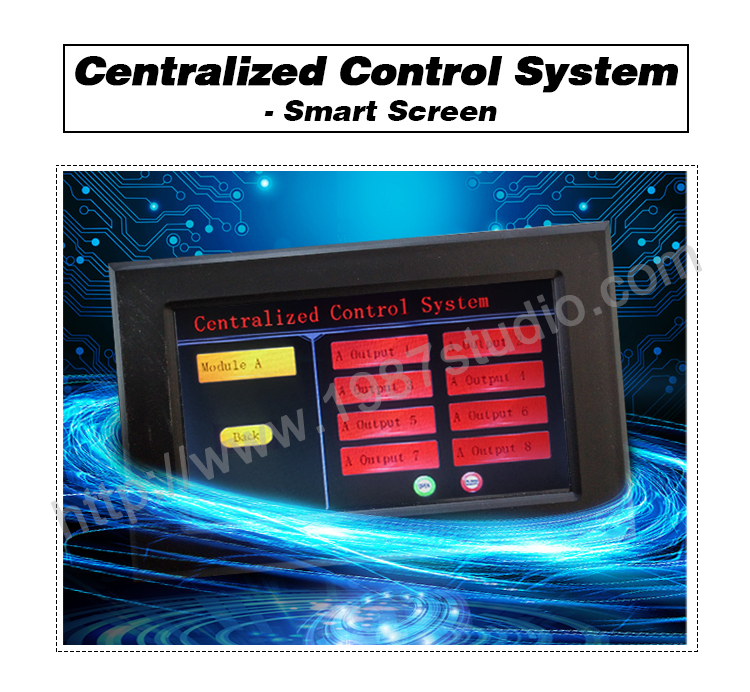 Escape room owners can use this system to centrally and conveniently control all the escape room electronic props. 2. Support to revise the audios. 3. 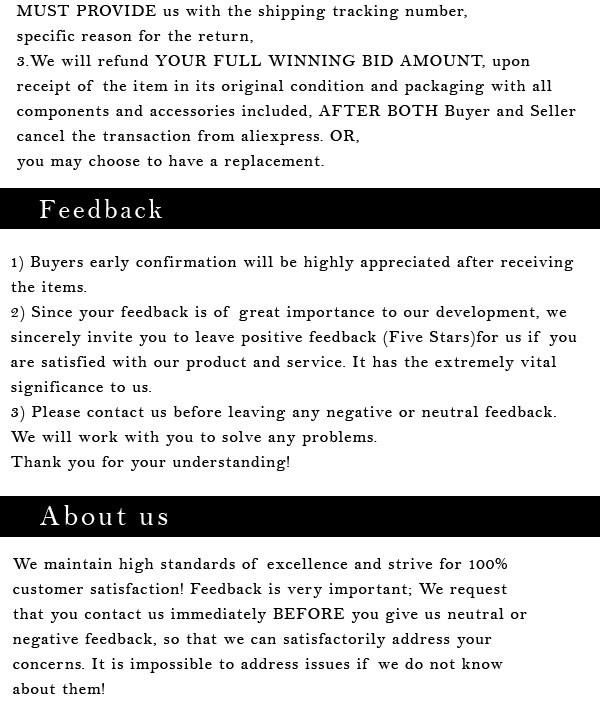 Support to choose the quantity of the switch modules. 4. Support to change the name of the buttons on the touch pad. 1. 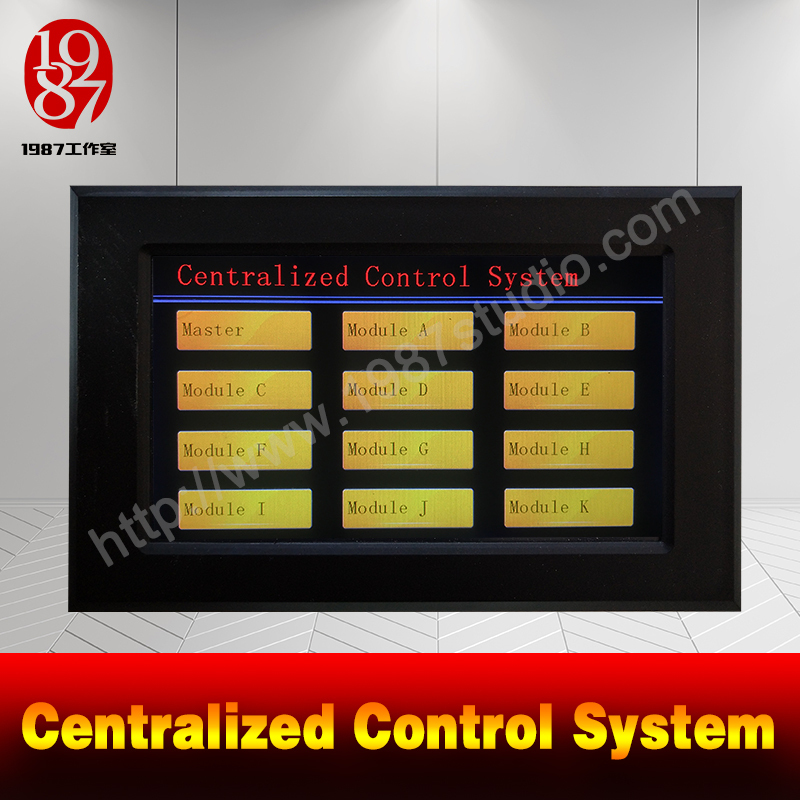 The Centralized Control System is designed for the convenience of room owners, to play the scenario’s introduction audios, to release and lock all the locks, to light up and light off all the lamps and belts, to manipulate all the electronic props. 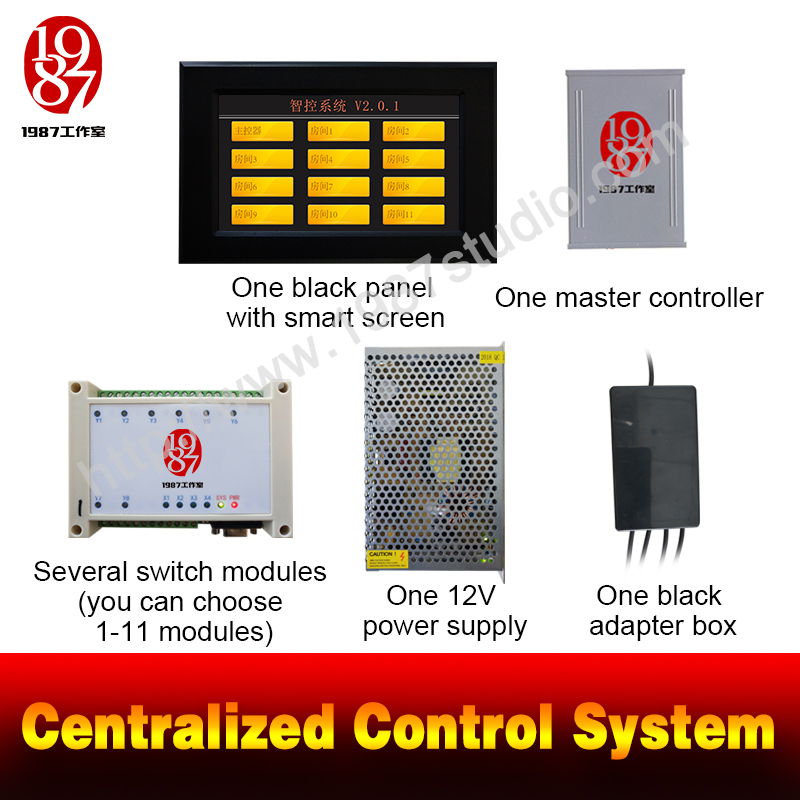 This system consists of one 12V power supply, one black adapter box, one master controller, one black panel with smart screen and several switch modules (the system supports 1-11 modules). Room owners can install this system’s master controller at the entrance,in order to connect with one lock or one lamp and play the scenario’s introduction audios. And room owners can revise these audios of their own. 2. 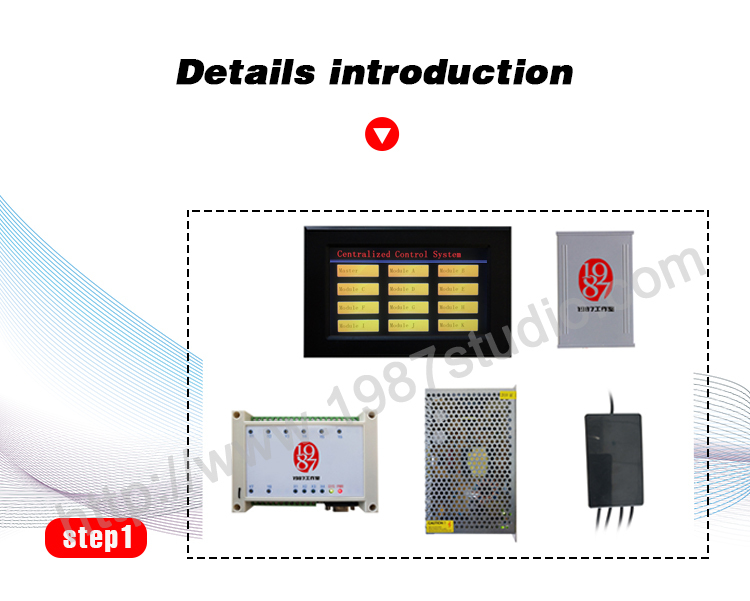 On the switch module, there 8 groups of relay switches Y1, Y2, Y3, Y4, Y5, Y6, Y7 and Y8, every relay switch includes three connection points: “常开” “公共” “常闭” and connects with one prop. 3. 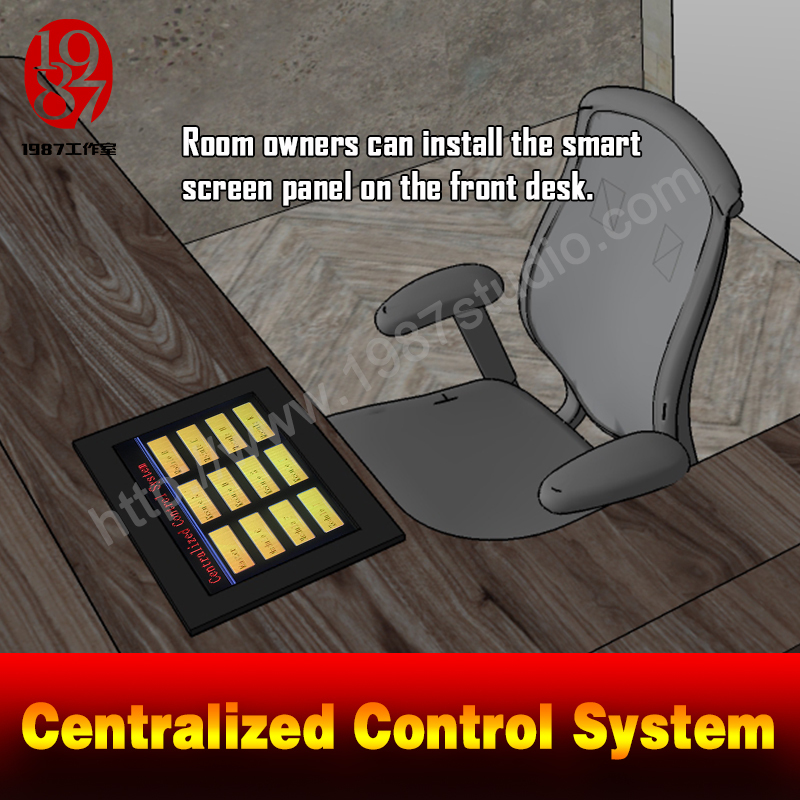 Room owners can install the smart screen panel on the front desk, so that room owners and their stuff can manipulate all the electronic props centrally and conveniently. On the Homepage of the touch pad, there are 12 buttons: one for master controller and eleven for switch modules (Module A-K). Click the first button “ Master” and enter the next page, there are eight buttons for playing corresponding audio, two little buttons “Open” and “Close” for releasing and locking one 12V EM lock and playing an audio at the same time, then click “back” to return Homepage. 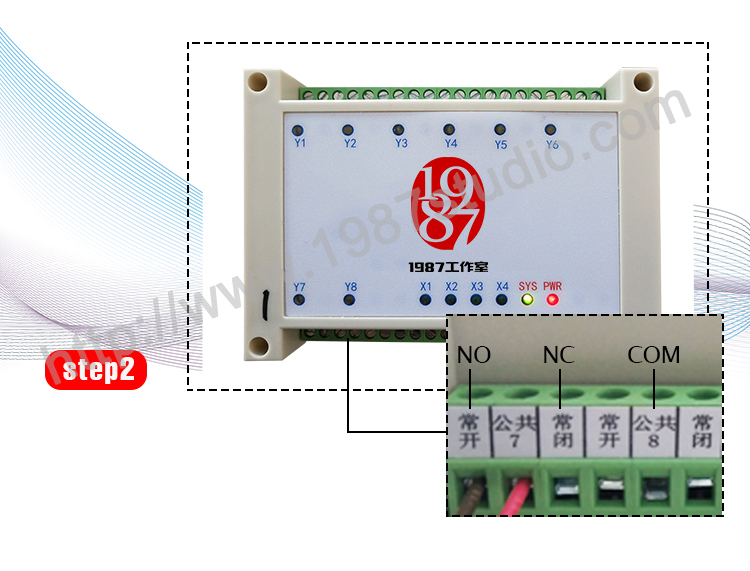 Click the valid module 1 or 2... to control the corresponding module and enter the next page, there are eight buttons for manipulating corresponding relay switches, Output1 for switch Y1, Output2 for switch Y2, Output3 for switch Y3 and so on, two little buttons “Open” and “Close” for controlling all the eight switches. The buttons have two colors, green signifies “switch does not act” and red signifies “switch acts”. Then click “back” to return Homepage. 2. There are four invalid connection points: X1, X2, X3, X4, and one invalid black interface. 3. 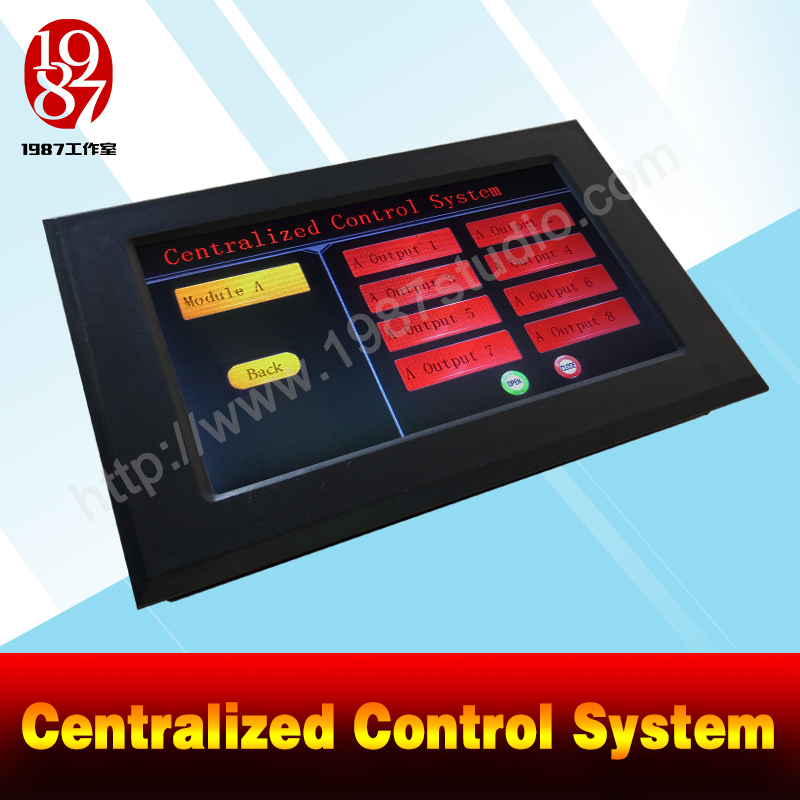 It's better to install the master controller and switch modules in the same place. And the connection between the master controller and the touch pad does not exceed 300 meters. 4. The connection between the with switch module and the prop should be more than 0.3 mm2. 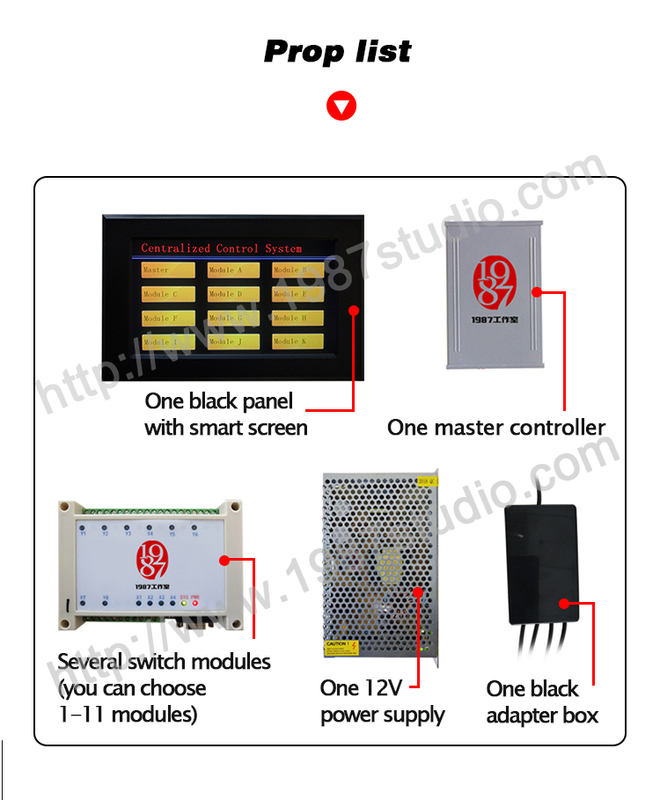 Several switch modules (you can choose 1-11 modules).